Chelsea (Thornton ’01) Buchholtz still can’t believe she’s Abilene Christian University’s 2017 Young Alumna of the Year. Just look at the previous recipients of the award, she told attendees at the Alumni Day lunch Feb. 19: 2016’s Gilbert Tuhabonye (’01), an inspirational speaker, author, running coach and philanthropist; and 2015’s Dr. Kent (’03) and Amber (Carroll ’06) Brantly, known for their work combating the Ebola virus in West Africa. Kent Brantly appeared on the cover of Time magazine and on NBC’s The Today Show. The chief of staff for the Texas Juvenile Justice Department does a bit more than that, as was clear from who came to pay tribute to her at the ceremony: Jeffrey S. Boyd (’83), justice on the Texas Supreme Court. 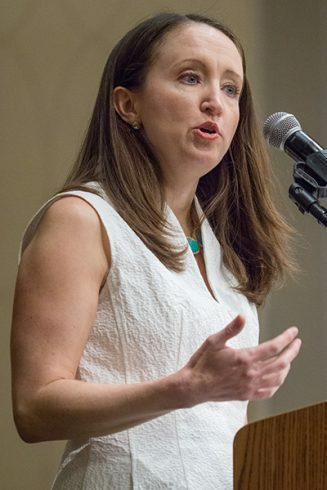 The two worked together in Texas Governor Rick Perry’s office before Buchholtz moved to the justice department, where she serves as an advocate for the department’s employees who work with the children in the juvenile system. 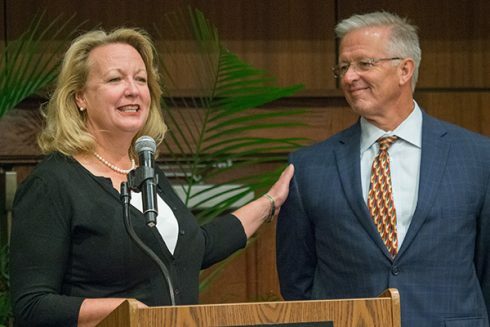 Buchholtz became emotional as she accepted her award and took time to thank those who have mentored her along the way, including her father, Gary Thornton (’72), former Trustee and ACU professor of journalism; former chief justice of the Texas Supreme Court Jack Pope (’34); and Dr. Gary (’64) and Sylvia (Ravanelli ’67) McCaleb. The Outstanding Alumni of the Year award went to Dr. David (’82) and Laurie (Stallings ’81) Vanderpool for their work as co-founders and chief officers at LiveBeyond in Thomazeau, Haiti. There, they bring medical and maternal health care, clean water, education, community development and the Gospel to the oppressed. The Vanderpools flew in from Haiti for the event at ACU’s Hunter Welcome Center. They were joined by their three adult children: David (’10), who spoke about his mother; John Mark; and Jacklyn. The couple were junior high sweethearts, Laurie said, and planned to be medical missionaries from a young age. David’s time as a pre-health major at ACU helped set him on the path to where he is today, he said. Before the award presentation, ACU president Dr. Phil Schubert (’91) reflected on his time spent at the LiveBeyond compound in 2016. The Outstanding Alumnus of the Year award honors timely recognition of lifetime achievement that brings honor to the university through personal and professional excellence and service to the university, church or community. 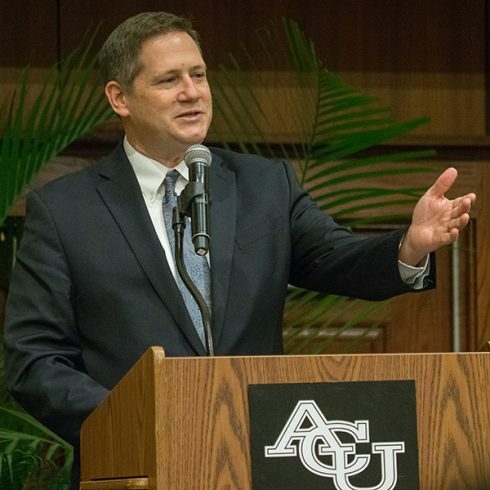 The Young Alumnus of the Year recognizes professional achievement and/or distinguished service to ACU. To be eligible, a recipient must not be more than 40 years of age at the time of selection. Make alumni award nominations here and learn more about past recipients. Texas Supreme Court justice Jeffrey S. Boyd was one of Buchholtz’s tribute speakers. 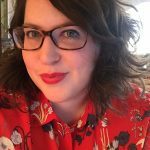 About the Author: Sarah Carlson is communications coordinator for the office of advancement at Abilene Christian University, her alma mater. She returned in 2015 after almost a decade working in journalism and corporate communication. View more from Sarah Carlson.